The Art Deco style helped to usher in the modern era of architecture. It provided a respite from the revivalist movements before it. One of its key elements is the flat roof, helping to introduce it to residential and commercial properties in North America. The flat roof may be synonymous with modern and contemporary architectural designs, but it actually originated in the ancient Middle East. The 1922 discovery of artifacts in the King Tut’s tomb in Egypt was the main source of inspiration for the Art Deco style. The flat roof was also a staple of Old World Persian and Arabian architectures. 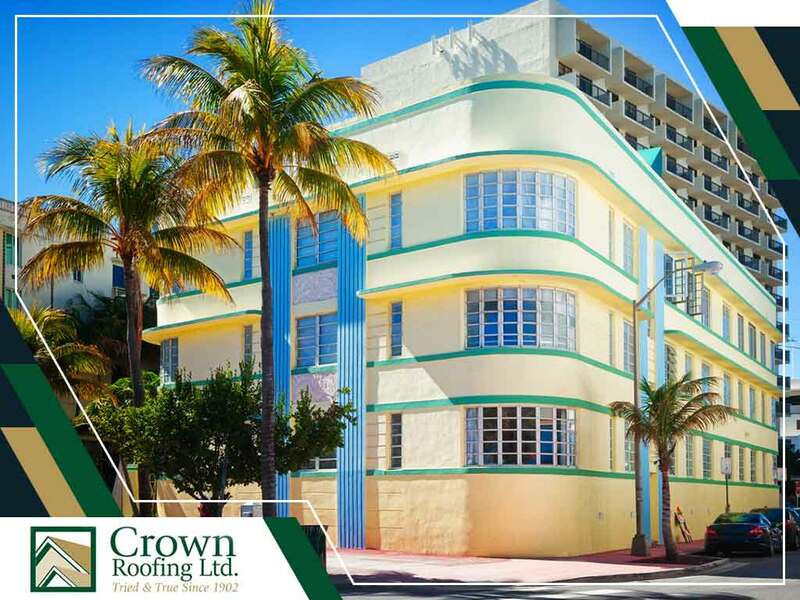 The Art Deco Style likes to use low-slope roofing systems with parapets to highlight entrances while preventing water damage to exterior walls. But, the opportunity to maximize the abundant flat area atop the property wasn’t wasted. In fact, most commercial buildings these days use flat rooftops for storage of bulky HVAC equipment. Residential properties, on the other hand, use portions of the roof as a terrace and even an optimum surface for solar panels. The low-slope roofs of Art Deco properties have a pitch of only 10 degrees or less, making them invisible from the street. Such structures were a refreshing sight when they were introduced. Although the siding represents most of the exterior, the unobstructed roofs of the Art Deco style help provide shade to shallow recessed porches below. Internal gutters are also used to drain pooling water within the enclosed top, hiding them out of view from the ground. While the Art Deco style’s popularity faded quickly, its strong influence continues to resonate in today’s structures. Turn to Crown Roofing LTD. to get its roof right for your home. Call us at (604) 210-6655 now to schedule an evaluation and get a free estimate in Vancouver, BC, or any neighboring community.